gui design software, skin maker, gui development, skin, skinning library, skinning, graphic user interface, interface skins, GUI customization, application style, unique looking GUI, unique style, support, install package, unique interface design Make your software spicy with SkinCrafter skins - improve your user interface! Skin maker for your software, skinning library for your application, unique program interface design solution - all these are SkinCrafter. You create software and we care about its user interface. Should you think of several color themes for your product - visit our gallery with hundreds of ready-to-use styles. 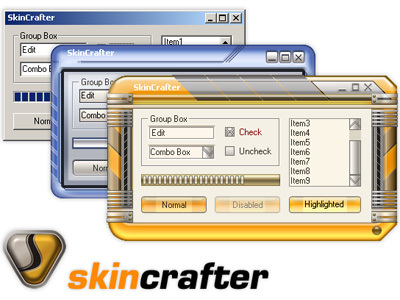 Moreover, SkinCrafter supports msstyles skins, which are available in thousands online. Try SkinCrafter demo today for free and see how simple it is to turn your application UI into stylish one. Check how SkinCrafter can improve a visual interface of any software. There is a variety of ready-to-use skins available in skin gallery. All licensed customers may use and modify all of them with royalty-free. Support of msstyles increases the number of styles you can use dramatically, as there are a lot of free msstyles in the net.